Many changes occur during puberty, including sprouting hair in places other than on the top of your head. Depending on genes, ethnicity, and hormones, you might have a small amount of facial hair, you might be able to grow a full beard, or you might have a range of hair that’s somewhere in between. All of these are normal. If you’re curious about what to do with the hair that’s growing on your face and you’d like to start shaving, read on for tips on how to do it safely. Depending on whether you want a close shave, or just a trim, you have two options – an electric razor, or a standard razor. Electric razors are generally battery-operated or rechargeable, and are used for trimming your hair. You won’t get as close a shave with an electric razor, but it also won’t cause nicks or cuts. If you use an electric razor, you don’t need shaving cream or gel, and remember that you have to use it when you are dry, meaning never in the shower or the tub or with water running from the sink. Traditional razors will give you a close, smooth shave. There are two types you can choose from – one that is completely disposable (meaning you throw away the entire razor and the blade), and another, where you just throw away the used blade and keep the handle. When you’re using a traditional razor, the most important thing to remember is that you need a sharp blade to avoid cuts and nicks. You will use shaving cream and gel and some water with this kind of razor. What other items do I need for shaving? 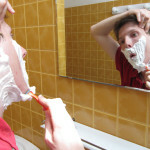 Shaving cream or gel: You will need a shaving cream or gel if you plan to shave with a traditional razor. Some guys prefer the thicker consistency of a cream while other prefer the foamy lather of a gel – you’ll have to try different types to find out what’s best for you. If you have sensitive skin, look for hypoallergenic products without added fragrance. If you find that after shaving you’re developing razor bumps, try a shaving cream or gel that contains glycolic or salicylic acid (to unclog your pores). Styptic pencils: Styptic pencils are used to stop the bleeding of minor cuts and nicks. If you’re new to shaving, it’s a good idea to keep one around. Aftershave: The purpose of aftershave is to soothe and hydrate your skin, as shaving scrapes natural oils off of your face. Aftershave products come in balms, gels, toners, and lotions, but it’s up to you to pick the kind you like best. Read the packaging and avoid aftershaves that include alcohol or menthol, because they may cause irritation or burn your skin. First, decide whether to shave before or after you shower. If you decide to shave before you shower, wet your face with hot or warm water. Some guys prefer to shave right after they get out of the shower, because the warm (or hot) water they’ve been showering in has made their skin hydrated and soft. Using your hands, apply shaving cream or gel to the areas on your face (and/or neck) you want to shave. Move slowly, apply a little bit of pressure, and take short, smooth strokes across your face. Shave in the direction that your hair grows. This is called shaving “with the grain.” Shaving “against the grain” can cause a rash or red bumps. After each stroke, rinse off your razor under running water to clean any clogged hair and extra shaving cream. After you’ve finished shaving, rinse your face with water, and then follow up with aftershave. What should I do if I nick (or cut) myself shaving? Nicks and cuts are very common, especially when you’re first learning how to shave. If you nick yourself, grab a clean cloth or tissue, and apply direct pressure. You can also apply a styptic pencil to seal the cut. There’s no “right” answer here – how often you shave is a personal decision that will depend on how fast your hair grows back, and the length you prefer to keep it (if you’re growing a moustache or beard). On average, guys who want to keep their face smooth shave every 1-3 days. How do I shave if my face is breaking out? If you can, take a break from shaving for a few days until your skin heals. To avoid further irritation it’s best to avoid shaving acne-prone areas of your face. Shaving broken-out skin can cause nicks, cuts, further irritation, and possible infection. If you must get rid of the hair, try using an electric razor to trim, rather than shave it. Growing facial hair is a part of maturing and becoming a man. Shaving is a personal preference, and a decision every guy has to make for himself. There’s no right or wrong decision about whether to have a clean shaven face, some stubble, or even a full moustache or beard. Just remember that taking care of your facial hair safely is the best way to prevent irritation, rashes, bumps, and infection.